As the Plus Two Examinations are over, the next job of students, who are desirous of joining in Engineering Colleges will be searching for the information relating to issue of application forms for admission, last year cut off marks etc., and the position of each engineering college, whether it is worthy to get or not and so on. 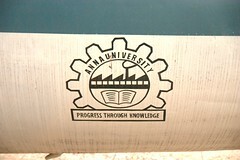 Application forms for admission 2010 in various engineering colleges under the single window system, through Anna University will be issued in the month of April 2010 and detailed notification in most of the leading Newspapers to this effect will appear soon. Candidates have to be very patient in selecting their choice of college by going in depth about the infrastructure facilities, details about the campus selection of that college. Outstation students should invariably find the facilities available in the hostel without any hesitation. Some students would opt for direct admission by paying some fees under management quota and such of these students should be more careful in selecting the colleges by verifying each and every favourable aspect of that college. I will be posting detailed information about the admission procedure in this blog and students having any doubt can post their doubts in the comments box.